Just occasionally you come across a film whose story contains an element you feel able to talk about with the authority of personal experience, but can't. Such is the case with Ichikawa Kon's 1955 feature Kokoro*, as to discuss the aspect in question would mean revealing a key plot point. Frustrating though that may be, it really wouldn't be fair for me to ruin a moment whose build-up is crucial to what gives Kokoro its powerhouse emotional kick. It's 1912 Japan, and Nobuchi and Shizu have the outward appearance of a normal, happily married couple, but their polite exchanges mask a repressed unhappiness that is somehow related to the death fifteen years earlier of Nobuchi's friend Kaji. In the years since then, Nobuchi has studied extensively but never found employment and no longer feels he has anything to offer the world of work. As he prepares to visit Kaji's grave, his wife asks him why he never likes her to accompany him. He reacts angrily to her enquiry, and once again goes alone. 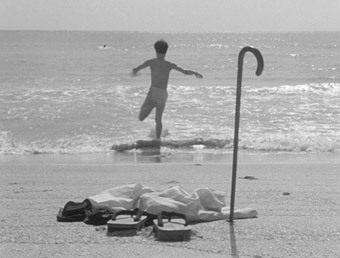 At the cemetery, Nobuchi is approached by enthusiastic 23-year-old student Hioki, who calls him by the honorific term 'sensei' (a word meaning teacher or doctor that is also applied to any – usually male – figure who commands respect for his knowledge or profession), a term Nobuchi himself rejects. "I am a wretched man," he tells Hioki over a beer, but with Nobuchi increasingly shunning the outside world he appears to genuinely welcome Hioki's soon regular visits. The younger man deeply respects Nobuchi's accumulated knowledge, but still does not understand the man he has come to admire. Left alone with Hioki, he questions her about her husband, but all she can tell him is that he changed after Kaji's passing, an unnatural death whose cause remains a mystery to both her and, she believes, her husband. The notion that she may be in some way responsible for her husband's unhappiness clearly upsets her. Hioki becomes keen to know more about Nobuchi's past, but when questioned directly, his sensei promises only to reveal all "when the time is right." Kokoro is initially a drama of mystery and subtle suggestion. Just what is it that has caused Nobuchi to slowly withdraw from the world and have such a low opinion of himself? What was the nature of the bond between him and Kaji and why does Shizu feel so intimidated by the ghost of his memory? And just why is Hioki so taken with the self-depreciating Nobuchi? Clues are thrown in but are open to interpretation: Nobuchi's reprimand to his wife's enquiry about Kaji, "It's not what you're thinking!" is echoed in a similar retort from Hioki to his mother after he volunteers to keep Shizu company in her husband's absence; Nobuchi's self-conscious switching of bar seats to avoid making eye contact with another customer; the offhand comments from Nobuchi that prompt Shizu to pause in self-reflective thought. Some clarification comes as the story unfolds. Hioki recalls in strikingly shot flashback how he and Nobuchi first met, when he swam out to rescue the older man from what looked like a suicide bid. 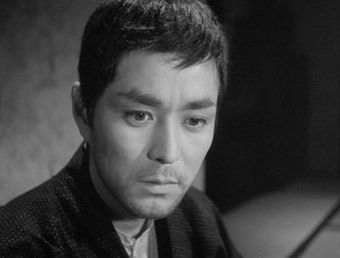 It's one of a number of ways in which death hovers over the proceedings, in the effect the loss of his friend has on Nobuchi's life, in the real world death of Emperor Meiji and the suicide of his loyal general Nogi, in the lingering terminal illness of Hioki's father, and in Nobuchi's expressed desire to take his own life in an act of loyalty to his Emperor. In truth, a large number of Japanese citizens did indeed commit sepuku following Meiji's death, which was seen by many as closing the door on a generation that grew up under his reign. Nobuchi's near-excitement at reports of such suicides is not initially taken seriously by Shizu, but the thought stays with him and the prospect that he might actually follow through on it colours the subsequent scenes. A good deal of Kokoro's storytelling strength comes from what it infers rather than explains outright, with the viewer left to draw their own conclusions regarding Nobuchi's relationship with Kaji and his reasons for marrying Shizu. Whether it was a decision made out of jealousy, resentment, a sense of betrayal or desperation is open to interpretation, but the consequences provide the film with some of its most emotionally devastating moments: Nobuchi's reaction to Kaji's sandals in the hallway (itself foreshadowed by an earlier close-up of him removing the footwear, a cutaway that made little cinematic sense until this moment); his heart-rending close-up as he reacts to what he subsequently overhears; the wording of Kaji's letter and the polite delivery of medicine as Nobuchi tries to hide his despair. They also infuse the scenes that follow with an overwhelming sense of sadness for the lives of those affected, even the action's selfish instigator. As suggested above, it's impossible to discuss these scenes in any detail without spoiling their first-view impact for newcomers. I am assured by a Japanese friend that Ichikawa adheres closely to the structure and even dialogue of Natsume Soseki's celebrated source novel, only losing out on the level of descriptive detail devoted to Nobuchi's internal suffering. That said, much is still most effectively communicated through Ichikawa's revealing and emotive use of facial close-ups and a quartet of superb performances from Nori Masayuki (Nobuchi), Aratama Michiyo (Shizu), Mihashi Tatsuya (Kaji) and Yasui Shōji (Hioki), each conveying the pain, concern, confusion and emotional turmoil suffered by their characters with a subtlety that could only fully register under the camera's intimate gaze. 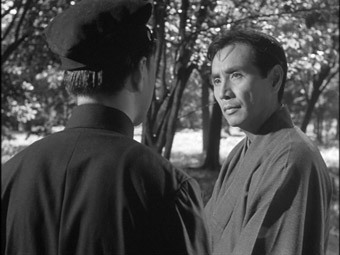 The characters are always the focus of Ichikawa's camera (dual cinematographers Fujioka Kumenobu and Ito Takeo should take a bow here), probing facial expression for suppressed emotion and locking faces in the sort of intimate two-shots that only the narrow width of the Academy frame can effect. When the camera moves it does so with purpose, travelling with the characters as they move so that we can continue to observe their expressions as they speak (with so much held back, this is crucial) or moving almost invisibly forward to highlight the emotion of a particular moment. 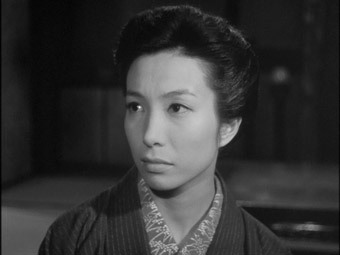 Even the more eye-catching shots have clear intention: the arresting opening close-up of Shizu that moves out and around her connects us instantly with her character and then quickly establishes her position as the 'good wife' expected of Japanese women at the time, while the rooftop track that follows a newspaper seller's journey down the street feels appropriate for the gravity of the news he is bringing. Much of Kokoro is inevitably specific to Japanese culture, particularly in the way true feelings are suppressed in order to maintain a surface order, but in a story that explores four different perspectives of the same course of events, there are still many empathy touchstones for a western audience to connect to, and it would be a cold viewer who would not be moved by Nobuchi's self-torment, Shizu's quiet despair, Kaji's pained realisation or Hioki's last-act sense of desperation. Exquisitely made and beautifully performed, it touches the heart while remaining wisely inexplicit on elements that are left for us to interpret, and in the process transforms a much loved novel into a work of true cinematic poetry. Framed in its original 1.33:1 aspect ratio, this is a lovely transfer of a most impressive restoration, the sharpness, contrast and tonal range all spot-on, while most traces of damage and dirt have been removed or cleaned up. A few blips remain either side of some of the reel changes and there is one shot that looks as though it's been rescued from a lesser quality original, but otherwise this is a first class job. The Dolby 2.0 mono soundtrack is inevitably narrow in its dynamic range and not as crisply clear as you'd expect of more recent films, but is largely clean off damage and noise with only a faint background hiss to disrupt the silence. The music betrays the age more than the dialogue, but on the whole all plays as expected for a film of this age, and a fair degree better than many I've heard. None on the disc itself, but as ever with Masters of Cinema there is a fine accompanying Booklet, this one containing a detailed essay on the film by Tony Rayns, a fascinating and substantial 1994 interview with Ichikawa Kon by Mori Yuki on the director's influences and how he came to cinema, credits for the film and some high quality production stills. A consistently compelling, beautifully made and performed drama from one of the masters of Japanese cinema, Kokoro is a work that demonstrates just how a little restraint can go a long, long way and how you don't necessarily have to fully understand a character or sympathise with their actions to care deeply for their fate. Handsomely restored for this Masters of Cinema release, this should be considered an essential purchase for devotees of Japanese period cinema and offers a fine introduction to those new to the pleasures of the form. Highly recommended.